Social Media is a huge part of people’s lives today, so it is important as a business to connect with your clients on these platforms. Having a strong social media strategy is going to help take your dental practice to the next level. Most businesses like clothing stores, restaurants, and other service-based industries have to work to convince potential clients that their product or service is a good use of their money, but dental offices have a slightly different goal when advertising. People already know they need to go see the dentist on a regular basis for proper dental hygiene. Staying top of mind is the best way to get them to book an appointment with you, and that can be done through posting on social media. When creating a social media strategy, it is important to remember to put yourself in your patient’s shoes. Understand your target audience, and create posts that they would like to see, engage with and that will get them to book appointments with your dental practice. 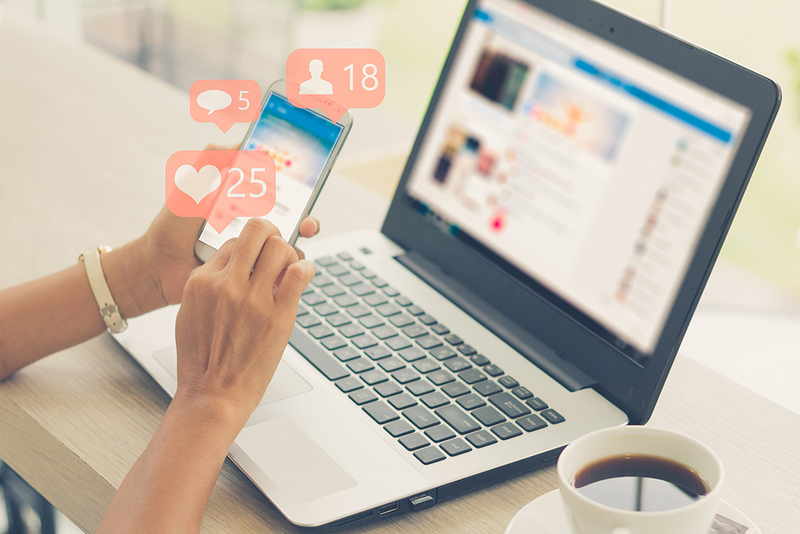 Social media can benefit your dental practice by attracting new patients, building relationships based on trust, and showcasing your brands’ authority and authenticity. Healthcare is a topic that people research heavily before making a decision because people want to make sure they are receiving the best treatment possible, either for themselves or a member of their family. When people decide on a dentist it isn’t for a one-off service, it is a commitment to a long-term relationship with this dental practice. That’s a big decision to make, so it comes as no surprise that when people are looking for a new dentist a lot of research goes into making that decision. Having a good online presence and social media strategy that outlines all of the wonderful things about your dental practice will help people feel confident in choosing you as their dentist. Being present online will increase the number of people who see you and your brand. By being able to interact as your brand via your social media profiles, potential clients will be able to get a sense of who you are as a dental practice and decide if you would make a good fit in their lives. Being open and friendly on social media will make people feel more comfortable getting to know you and your practice, allowing them the chance to understand who you are and the services you can offer for them. Trust between a dentist and their client is extremely important. People are entrusting you with one of the most important features – their smile! They need to feel like they are in good hands when they come in to see you. Having a presence and connecting with them on social media platforms is a great way to start to build that foundation of trust before a new client comes in to meet you. Fun and light-hearted social media content can help people who may feel nervous about going to the dentist, feel like your dental practice is one they can trust to make them feel safe and comfortable during their dental appointment. Social media is also a great place to showcase the amazing work that your dental office does. Many social media platforms are photo and video-based, allowing your practice to show off what skills, technology and services you have to offer. A beautiful smile can bring someone so much confidence. Being able to show potential patients that you can help them achieve the smile they have always dreamed of, comes in no better way than through social media. Customer reviews and testimonials are another way to increase people’s trust in your ability. Social media can allow you to feature some of the amazing experiences people have had when they come into your dental practice. Many people rely on the experiences of others before they decide if that service or business is right for them. Before the rise of social media, testimonials and sharing experiences were mostly done between friends and family, through word of mouth. Now social media has allowed businesses the perfect opportunity to show off the reviews they receive in a place where they can reach a wider audience and attract new customers. Social media has become the perfect tool for dental practices to use to spread their brand and their messages to more people. Creating and sharing original and engaging content can show potential dental patients that you are at the top of your field and can provide great service to them and their family. By showcasing the experience and knowledge of your dentists and dental office, potential and current patients will feel comfortable knowing that they are in good hands. People also want the opportunity to understand who you are as a dental practice before making a decision to work with you. Social media can allow you to show people who you are, providing them with the opportunity to decide if your practice ideals match their personal ideals. This is why it is important to be authentic on your social media profiles. Being authentic allows people to truly understand your dental practice, your goals and personality of who your brand is. Authenticity leads to better trust between potential and current dental patients and your dental practice. By being honest and engaging online, people feel a connection to the brand leading to a better relationship. Social media can help any business, operating in the modern day, in growing their client base. Specifically, for dental offices, a unique and compelling social media presence will help your practice to attract new clients, build trust, and showcase authority. It is important to remember that people are spending more time on their phones than on desktop computers, making it important to optimize your social media strategy and content for desktop as well as mobile. Having a well-designed digital presence can help your dental practice to reach a new wider audience and allow people to interact and connect with your brand before even visiting in person. We would love to work with you to create a social media strategy that is best suited to your brand and specific goals. For more information on our Social Media Branding service, you can check out the page on our website, or you can fill out our form for a consultation to implement this into your dental practice.